The Court of Appeals for the Federal Circuit is a unique institution. Unlike other circuit courts, the Federal Circuit’s jurisdiction is bound by subject area rather than geography, and it was created to address a unique set of problems specific to patent law. These characteristics have affected its institutional development and made the court one of the most frequently studied appellate courts. This chapter examines this development and describes the evolving qualities that have helped the Federal Circuit distinguish itself, for better or worse, as an institution. This chapter begins with an overview of the concerns existing before creation of the Federal Circuit and then discusses the Federal Court Improvements Act of 1982, including what Congress was trying to achieve with the Federal Circuit and how the court was structured in terms of subject matter jurisdiction and the courts it replaced. Next, this chapter will describe the problem of not having a uniform patent law and how the Federal Circuit has impacted uniformity. It will describe how forum shopping was influenced and whether uniformity has affected the diversity and percolation of ideas related to patent law. This chapter then discusses how the Federal Circuit has impacted certainty and predictability of patent law. It begins by looking at where the pressure for certainty comes from. It then focuses on the Federal Circuit’s treatment of a few representative issues to determine whether the court has succeeded in providing it. 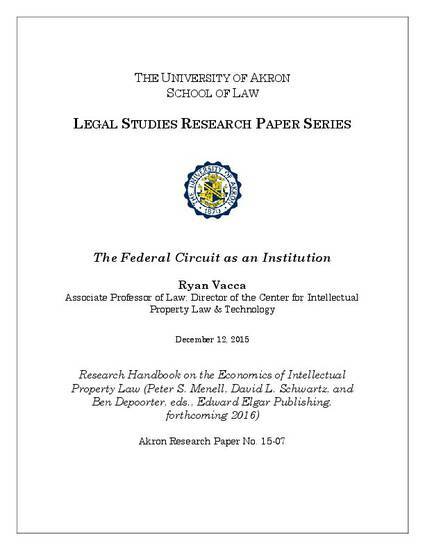 Next, this chapter explores the quality of the Federal Circuit’s patent jurisprudence, including whether the Federal Circuit is too formalistic in its decisionmaking and if it pays enough attention to policy and technological considerations and scholarship. Given the focus on the Federal Circuit as an institution, this chapter will describe how the Federal Circuit is structured, the makeup of the individual judges on the court, and how these qualities affect the court as such. The role of individual judges and types of judges on the Federal Circuit are examined as well as how internal dynamics and en banc hearings play a role in the decisionmaking process. This chapter then explores the Federal Circuit’s interactions with other institutions and examines which institutions are and should be performing what role in the development of patent law. This section notes the interesting and dynamic interactions the Federal Circuit has had with the Supreme Court, the United States Patent and Trademark Office, district courts, the Solicitor General, and Congress. Finally, this chapter closes with concluding thoughts about empirical research on the Federal Circuit and suggests further areas of exploration.